Who is John Chen, BlackBerry's new CEO? 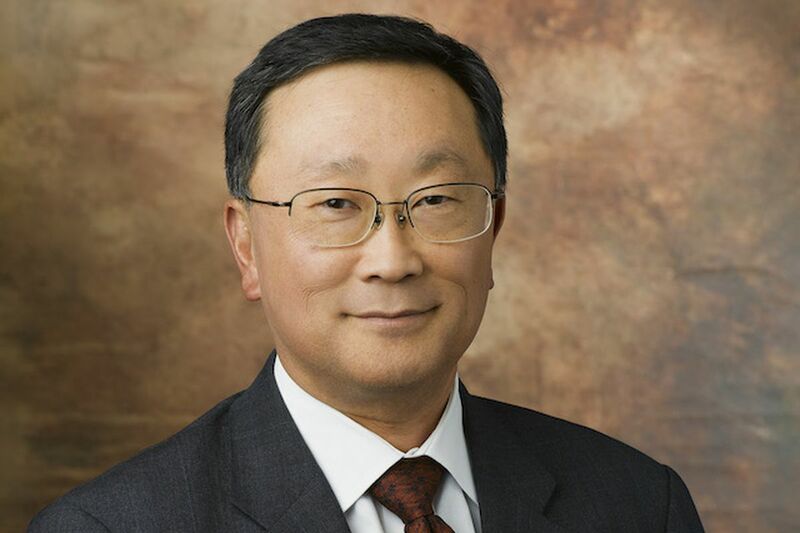 Share Who is John Chen, BlackBerry's new CEO? BlackBerry is bringing in a fixer. The struggling smartphone maker has long been run by its own talent — a founder, an early investor, and a guy who worked his way up the ranks — but in about two weeks it will bring on its first outsider: John Chen. Chen is known for turning around failing companies, and he’ll soon be tasked with doing that yet again as BlackBerry’s interim CEO. His appointment comes alongside a failed takeover by Fairfax capital that couldn't manage to attract any outside capital. Instead, Fairfax and a small group of investors are now pouring $1 billion more into the struggling phone maker, and betting big on Chen for a turnaround. Though Chen has worked in a number of executive positions over the years, he’s best known for his time as CEO of the enterprise services company Sybase. Once a competitor to tech giants like Oracle, Sybase fell hard in the late '90s. As Bloomberg Businessweek reported last year, Sybase’s fortunes were so bad that one research firm had pegged it with a 70 percent chance of failure when Chen stepped on board in 1998. The company was reportedly worth just $362 million then, but after 13 years under Chen it was acquired for $5.8 billion. Today, Chen’s plan for moving Sybase into profitable markets seems all too logical, but it wasn’t an obvious bet at the time. "I thought, wouldn’t it be great if we could exploit what we know and then skip a generation and go ahead of our competitors and become more relevant," Chen said, describing Sybase’s venture into mobile to The New York Times in 2006. "People were laughing at us for getting into mobility so early and they were saying there’s no money there, wireless is just a dream and everyone’s losing so much money. We are now the largest enterprise-software provider in wireless technology." BlackBerry has already committed to focusing more on enterprise, and Chen’s appointment will likely accelerate that. It’s not far from how Chen managed to spur profits at Sybase, gradually moving the company into fast-growing areas like analytics and mobile services. Though these enterprise services rarely sound exciting, Chen’s insight was to see that there was money to be had in those areas not far down the road. "If you think that e-commerce was a big sea change in the early 2000s, [mobile]-commerce will make e-commerce a very small thing," he told Network World in 2010. "The first thing I needed to do ... was restore the confidence of the people." But Chen’s interest in mobile only came after he managed to stabilize Sybase in the first place. When Chen came on board in 1998, the company had been losing money for four years running. His first move — and something that BlackBerry may dearly need — was to rally his workers. "The first thing I needed to do when I joined was restore the confidence of the people," Chen told Computer Business Review in 2005. "I needed to restore confidence that you have a theme and can execute. I didn't want to wander off too far from our core competencies any more." Chen wouldn’t allow Sybase to continue operating in areas that it wasn’t strong in. "I want to make money and have a good business in everything we touch," Chen told the Review. "I don't do anything that loses money. That saved us from the dot-com bubble." He focused Sybase by breaking its structure down into smaller chunks. There weren’t redundancies, and Chen felt that the tighter structure allowed Sybase to react quickly to changes and decisions. Even so, drastic changes may not come to BlackBerry immediately. Chen has already said that he won’t be shutting down the company’s handset division, despite the fact that it's losing money. But he believes that BlackBerry is positioned well enough to manage a turnaround. "I know we have enough ingredients to build a long-term sustainable business," Chen tells Reuters this morning. Drawing on his prior experience, Chen brushes aside investors’ fears with aplomb, "I have done this before and seen the same movie before." Chen’s skills extend beyond his business acumen as well. During his time at Sybase, Chen also served on then-president Bush’s Export Council, a committee that issues advisories on international trade policy. In particular, Chen is noted for his knowledge of US–Asia relations, and has testified before Congress on trade issues. After finally leaving Sybase in 2012, Chen took a position at the private equity firm Silver Lake, where he worked as a senior advisor. His tenure there has been brief so far, but the position lends further to his skills in stripping down and focusing companies while helping to oversee a turnaround. While Chen’s transition over to Silver Lake occurred just days after leaving Sybase, there was a brief moment where his future seemed to be up in the air. When asked by Bloomberg Businessweek what might be coming next, Chen joked, "It’s going to be in technology, I don’t have any other skills." Coy as his answer was, Chen is now back in the technology game and likely with more eyes on him than ever before. But if you're in the business of betting on who could turn BlackBerry around — and Fairfax Financial definitely is — Chen's not a bad choice to put your money on.